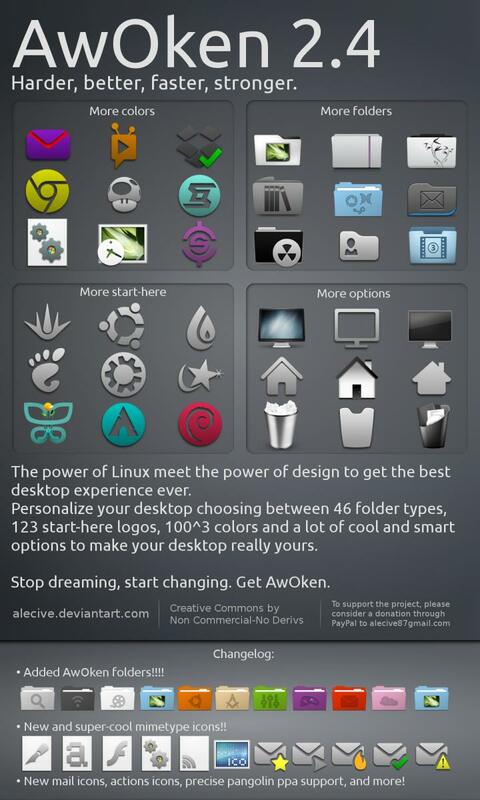 AwOken Icon Set has been updated to version 2.4 bringing in Precise support and improved colorization script. Added AwOken folders. Now the set is integrated with the new cool and stylish folders ever. Drastic revision of mimetypes: now they use a different template icon (modified from Elementary icon set), and they're more refined in 24x24 version. Most of the 22x22 actions icons that have characterized the latest versions have been brought to 24x24px and 128x128px resolutions. 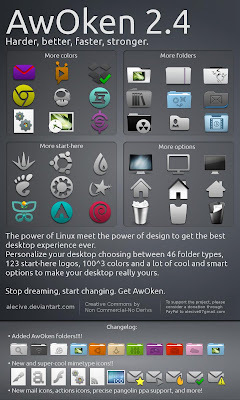 So the icon set become cleaner, cooler and more integrated! Consequently, also some status icons are changed. Mail icons redrawn (both in bigger and in lower resolution). Now your favourite email client's toolbar (except thunderbird) works like a charm. Drastic revision of the colorization script: now is faster, cleaner and supports parallel processing. This lead to a serious improvement on latest multi-core machines, but also on elder computers. Another big improvement is related to the fact that is now accepting RGB colors instead of CMY colors. Revision of the Installation and Instructions PDF file. Removed gedit choice from the customization script (it's useless having the possibility to change only one icon).